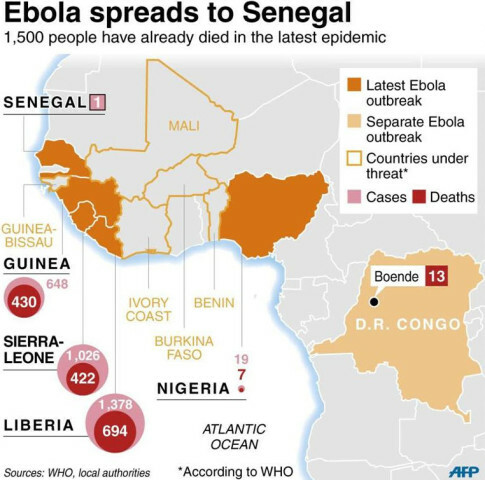 Senegal had previously closed its border with Guinea in an attempt to halt the spread of Ebola, but the frontier is porous. It had also banned flights and ships from Guinea, Liberia and Sierra Leone – the three worst-hit countries. Awa Marie Coll Seck told reporters on Friday that a young man from Guinea had travelled to Senegal despite having been infected with the virus. The man was immediately placed in quarantine, she added. In Guinea, a 24-hour curfew has been imposed in the second city, Nzerekore, because of a riot after the main market was sprayed with disinfectant in an attempt to halt the spread of the virus. The exact cause of the riot is not clear – some people reportedly feared the spray would spread Ebola, while other chanted: “Ebola is a lie”. Police responded by firing tear gas. The city is the capital of the Forest Region, where the Ebola epidemic has its epicentre – near the town of Gueckedou. However the BBC’s Alhassan Sillah in Guinea says the town has miraculously remained free of Ebola so far. First of all, closing the borders doesn’t work. People not yet sick, not aware they are infected travel around. Shooting the patients doesn’t help, and more exposed people flee toward saner nations. It is already in the west; people in Canada and the US have been treated for it. We don’t know if they lived or died……. Blackouts on the disease isn’t smart, either. We need some sane people at the head of this…..if they exist. Having been to the little white bit in the middle of Senegal, called “The Gambia”, I can confirm it is a culture shock. Kids are mutilated at birth to make them beggars for tourists. Open sewers, abject poverty and minimal education make it ripe for disease. A classic case of British Imperial abuse, Welcome to the Commonwealth! A perfect opportunist location for disease experimentation. Yet there is a “Guinness” brewery there!! !